Five times in the history of the United States, the nation’s governors have gathered with business and education leaders to discuss actions necessary to improve public education. Together, the National Education Summits have been instrumental in creating and sustaining public support for the drive to raise standards and improve performance in schools. 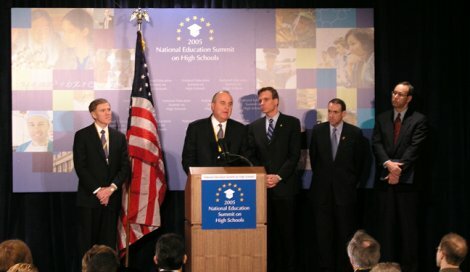 At the 1996 Summit, the nation’s governors and business leaders pledged to work together, state by state, to raise standards and achievement in public schools. The Summit also led to the creation of Achieve to help states raise academic standards, improve assessments, and strengthen accountability.